Words hold a lot of power. One little phrase has been on my mind that can be well intentioned, but doesn’t end up always doing a whole lot of good. Don’t get me wrong. There is a time and place to apologize. But how often do we just throw “I’m sorry” around as an automatic response or filler? For something that’s not actually your fault? For not always responding to that text right away? For something you can’t control? I’ll admit, I am totally guilty 🙋🏻 It got so bad that a former boyfriend would reprimand me whenever I said sorry and didn’t have a real reason (which was probably 90% of the time). Not that we shouldn’t say sorry. I’m not advocating to stop apologizing. If you have a legitimate reason to apologize, do so and make it mean something. But don’t just say sorry to say it or use it as a filler when you feel a little awkward. Generally, you are harder on yourself than other people are. Other people don’t expect you to apologize when they are in your way. Yet I’m sure many of us do it all the time. Needlessly apologizing all of the time can undermine confidence, both in how you see yourself and how others see you. Plus, taking blame for someone else’s mistake to get out of a potentially awkward situation isn’t helping either of you in the long run. Try it: through out your day, keep track of all the times you say “I’m sorry” — even when you don’t really have anything to be sorry for. When I actually started paying attention to how often I said sorry and how often I actually needed to apologize, there was a big discrepancy. I consciously made an effort to stop saying sorry unless I actually felt like I needed to apologize. I forced myself to stop and think before responding: do I actually feel sorry? Do I actually have something I feel like I need to apologize for? Not surprisingly, my “sorrys” went waaaay down. Not that I am perfect by any means. There are plenty of situations where an apology is called for. And I still apologize when I shouldn’t be on a regular basis. 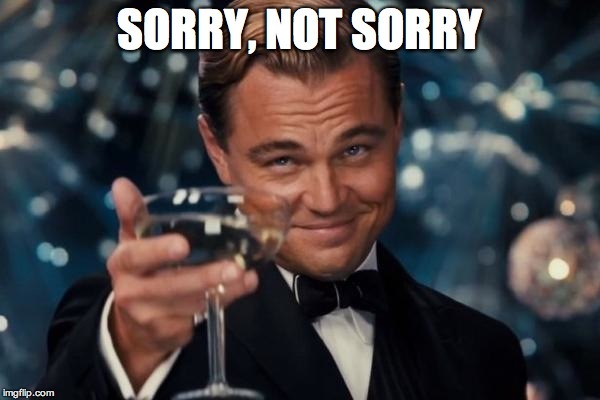 But now that I am more aware, I try to be more intentional about my words when it comes to “sorry.” I want my apologies to actually mean something when I say it. And I’ve gained more self-confidence. I’m not blaming myself for things that I don’t need to feel guilty about. Anybody else out there struggle with apologizing? I’d love to hear your thoughts on this issue!